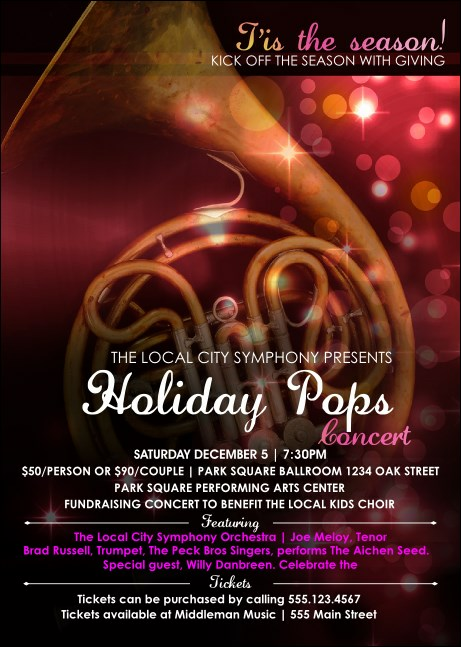 Draw a crowd to your performance to the tune of the Symphony Holiday Pops Postcard Mailer! A brass horn and twinkle lights set a festive tone for seventeen text lines of your concert’s details. Customize to your celebration, then upload your mailing list. We’ll print in color and mail to your prospective attendees in a flash! Printed postcard dimensions: 4.25" x 6"
Increase your reach to potential event attendees with direct mail! Find the right postcard at TicketPrinting.com.